A lorry loaded with parcels overturned after crashing into repair vehicles. The A34 in Oxfordshire was closed for 13 hours as rescue crews removed the packages before recovering the HGV. 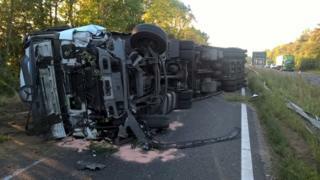 It hit a Highways England vehicle before crashing into a second lorry and rolling onto its side at about 03:00 BST. Des Leech, from Highways England, said: "If you were expecting a delivery in the next couple of days and it's delayed, this could be why. "We had to get all the parcels out of the lorry before we could start to recover it, and the lorry itself had got itself wedged in the trees and barrier." Workers from the agency had just completed repairs to the central reservation near the A420 Botley Interchange when the crash happened. Mr Leech said some had sustained minor injuries, but "we were incredibly lucky there were no serious injuries". As part of the recovery operation crews had to clear debris, remove part of the newly damaged central reservation, and cut down trees to allow access to the scene. The southbound carriageway eventually reopened at about 17:00 BST. A northbound lane was also closed. Mr Leech said: "We appreciate there's been some terrible disruption in the area caused by this." South Central Ambulance Service said the lorry driver received minor injuries and was taken to the John Radcliffe Hospital in Oxford.